The most revered disciple Swami Rama Misra (Manakkal Nambi) appeared at maNakkAl (a village on the banks of river cauvery, near srirangam). 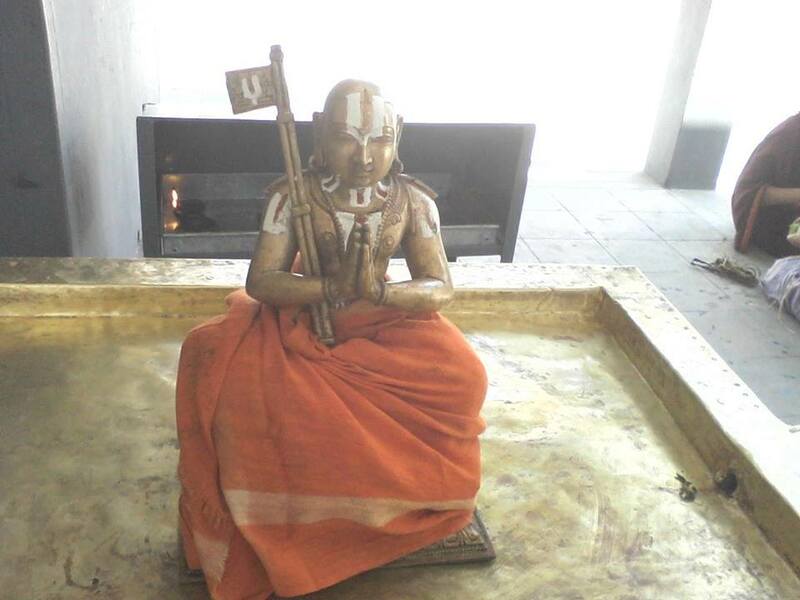 He lived with his Acharyan UyyakkondAr and served him for 12 years at the holy place Thiruvellarai. . UyyakkondAr pleased with Swami Rama Mishrar appoints him as his successor while leaving to paramapadham ( srivaikuntam) . 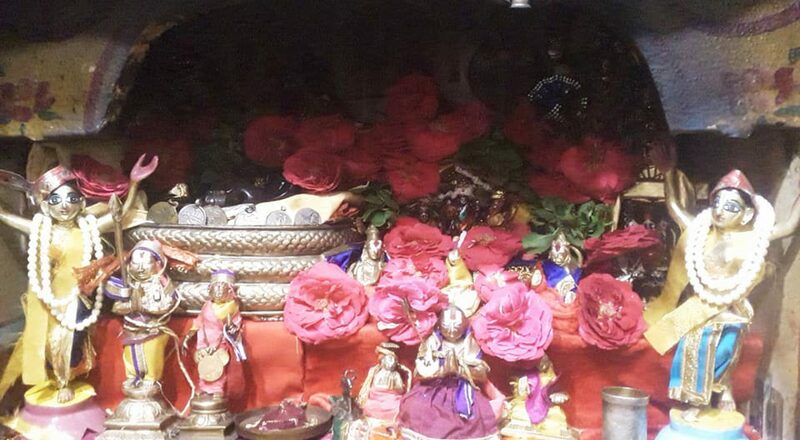 He advises his disciple Rama mishrar ( Nambi) to train Ishvara muni’s son Swamy Yamunacharya such that he takes over the duty of spreading the sri vaishnava dharisanam. Meanwhile at Srirangam , Swamy Yamunar joins the school of Sri Mahabhashya Bhatta who is well versed in all the vaishnava sampradayas . During this period all the Vidwans (scholars) in the Chola Kingdom had to pay annual tribute (prescribed fee) to Aakkialwan, the royal purohit who was close to the King . As it is the case ,one day on receiving the notice for payment , Mahabhashya Bhatta became very sad, as he was penny less. Observing his Acharyars sad face, and coming to know the difficult situation, Swamy Yamunacharya took it upon Himself to put an end to the audacity and the atrocity of Royal purohit Aakkialwan . In presence of the gaurds ,Yamauna tears the notice to pieces and sends the messenger back. On hearing the happenings there , Aakkialwan send backs the messenger to check whether Yamuna was a poet or a scholar well versed in Shastras. The gaurds come to know about Yamunas proficiency from the neighbors and informs the Purohit about his strong hating to the opponents . Aakkialwan , astonished at the scholarship of Yamuna informs the Chola King. The King orders this young Scholar to come to his court immediately. Yamuna bluntly refuses. The King realizing that he wasn¡¯t dealing with an ordinary person, sends a palanquin along with bearers to bring Swamy Yamuna. As Yamuna reaches the courts, he passes a sloka to show his scholarship. ¨ Though you strive hard to find an equal to me , mastered both the Meemamsas starting from the slope of the Himalaya mountain (in the north) which is lucky enough to possess the tender foot prints of the mountain girl Parvathi up to the bridge (in the south) which caused the blooming of the Lotus like face of Sita, abducted by the demon Ravana and also beginning from the rising mountain (in the east) of both the luminaries Sun and Moon and ending with the setting mountain (in the west). As Aakkialwan read the sloka, his face turned red and he shouted aloud that he would debate with this young imposter. Looking at Yamuna, the king orders him ..
Having invited all learned men, the King occupying the royal throne along with his queen at the debating hall looks at the young man . The queen, being very much impressed by the handsome appearance of the young man, drew the attention of the King towards him and exclaimed that he would never sustain defeat in the wordy quarrel. If at all Yamuna is defeated, she said that she would become a maid and cook the food for the dogs in the palace. The King too retorted saying that in case Aakkialwan was the loser, he would part with half of his kingdom by presenting it to Yamuna. The debate started much to the eagerness of the Royal couple . Aakkialwan said to Yamuna, Let us start with ordinary worldly affairs. I will negate all your affirmatives and your negative statements will be made affirmatives by me. Agreeing to this proposal, Swamy Yamuna uttered three sentences to Aakkialwan expecting him to counter the statements ..
1) Your mother is a barren woman. 3) The Queen is a very chaste woman. Fearing severe punishment at the hands of the king by the denial of the three statements, Aakkialwan simply blinked and winged his hands. Yamuna came out with his denial of these three statements and explained from sastras . 1) A single tree cannot become a garden. Similarly one child is not enough to make a mother. As Aakkialwan is the only son of his mother, she is still a barren woman. 2) The sins committed by the subjects will go to the King, as he has not prevented them from doing so. Thus the king loses his righteousness. 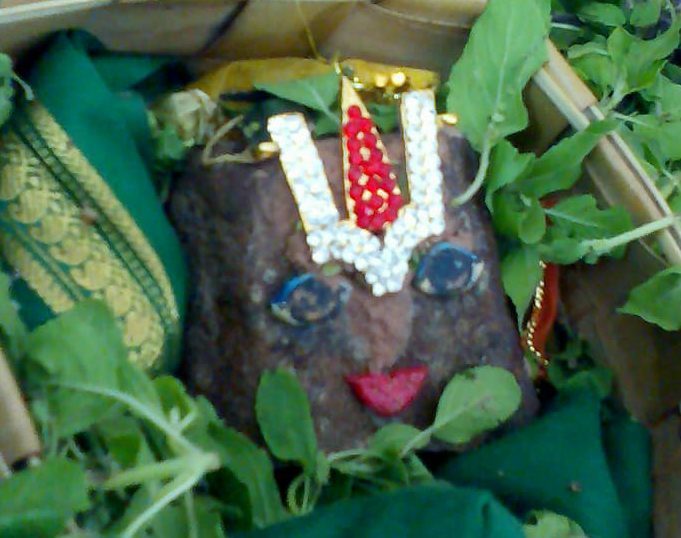 3) Normally a girl becomes the wife of some divine personalities like Indra etc. after her marriage. Hence, the husband is not allowed to share her bed immediately after the marriage. Thus the queen has forfeited her claim for chastity. Oh gentleman! I will not strike you on your head as per our agreement before the debate. It is because, I give due respect to your age and the exalted position that you occupy in the royal court. This proclamation earned the appreciation and approval of all the scholars. The queen rushing towards Yamuna embraced him and observed with a slippery tone full of affection You have come to my rescue. 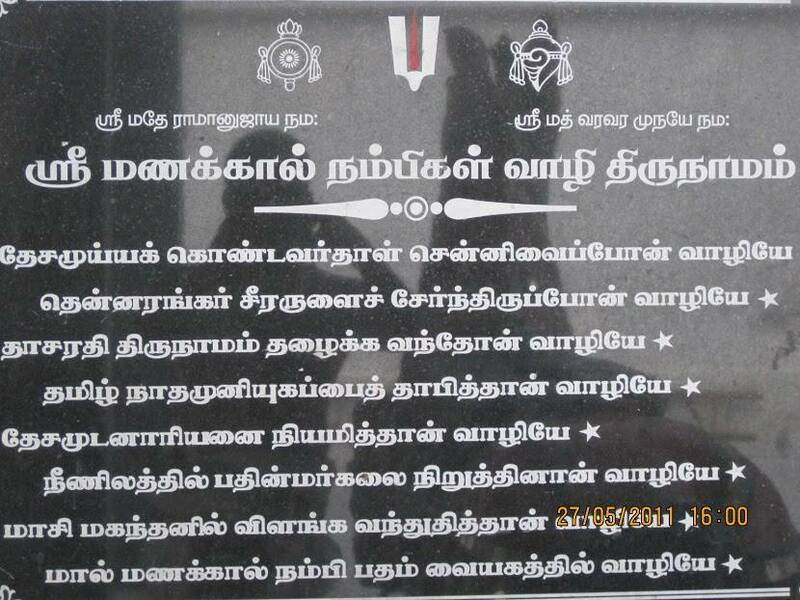 Hence you are my ruler (Ennai Aalavandeero!). From that day onwards he came to be called Aalavandar. Having said so, she took him to the palace accompanied by the King. His Majesty also kept up his promise by offering half of his kingdom to Aalavandar. Enjoying all the royal pleasures in the company of his wife, the young prince ruled over the kingdom happily and peacefully. 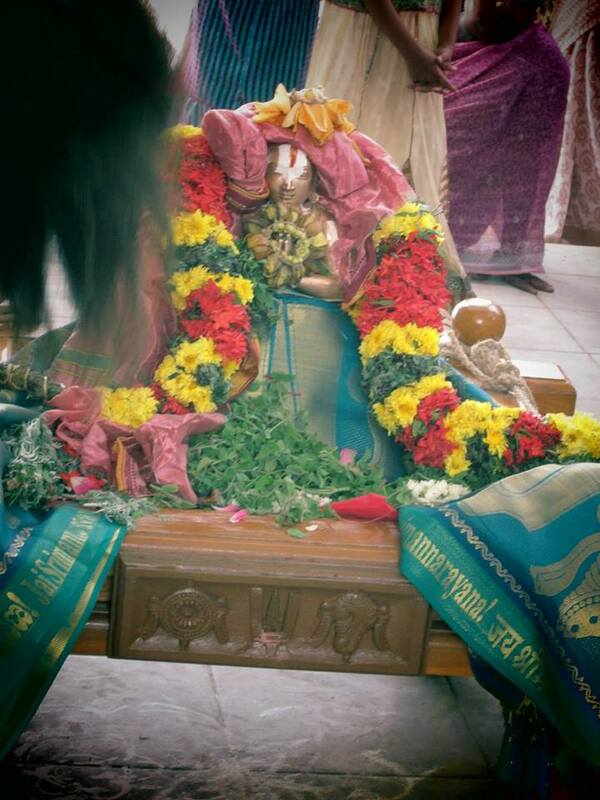 Manakkal Nambi got this news that the future Acharyar of Srivaishnavism has become the King . Watching silently the eminence which Alavandar had reached so rapidly and Aakkialwan ’s ignominious defeat and Alavandar becoming a king, his joy knew no bounds He wanted to fulfill his promise to his revered Guru Uyyakkondar in bringing him back to the Sampradaya . He thought of his Acharyar’s instructions in making Alavandar the future Apostle of the Faith. So, he went to the palace, but the guards obstructed his entrance. He found his way however into the kitchen where contracting friendship with the cooks, had ascertained from them the potherbs that pleased Alavandar most. He took that herb Thoodhuvalai, a kind of spinach, daily to the kitchen for a period of six months; and yet no notice was taken of it. Wearied, he stopped away for a few days. Alavandar finding his favourite dish missing from his dinner so suddenly enquired of the cooks the reason. They informed him of an old Brahmana having, for six months uninterruptedly, brought the green herb and having stopped the supply for a few days. 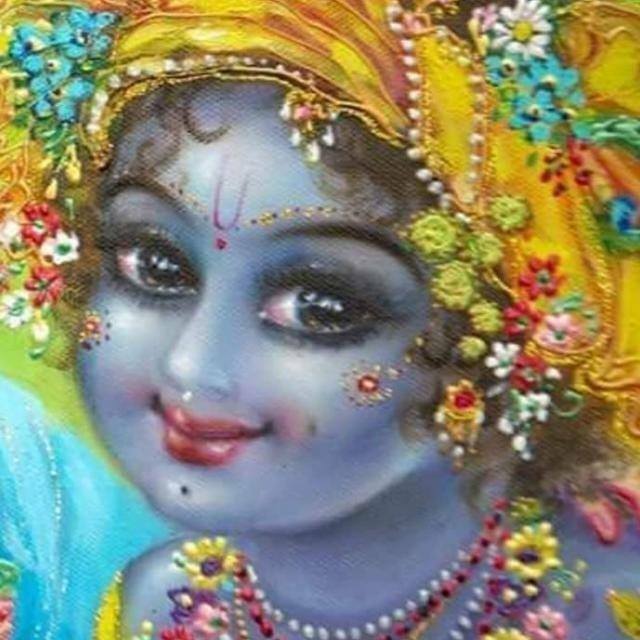 “If he should return again,” commanded the king, after chiding them, “inform me at once.” Rama Misra thought he would try again, and so put in his appearance with the favourite vegetable, after some interval. The king was immediately informed; and he ordered the venerable man being conducted into his presence. When he duly arrived, the king rose, and making obeisance, seated him with every mark of respect; and asked how he may reward him for his services, -by money or by lands. Our Misra said: “Good king, these riches I do not need from thee; for I have precious riches, amassed by your ancestors, to give thee; and I shall show thee where they lie treasured up. Till I put thee in possession of these, let me be admitted to thy presence without hindrance by the guards at thy gates.” Alavandar was taken out of himself by this unexpected revelation, and placed his men under instructions to admit the worthy visitant freely without caring for ceremony. Swamy Rama Misra now began to teach Alavandar the Bhagavad Gita, the essence of all the Upanishads. As Alavandar listened attentively through the eighteen books of this Sublime Poem, his spiritual sense was awakened, and a craving caused in his heart to realize God, as is spoken therein. “How shall I realize Him?” asked he of his Acharya. “That is taught in the Great Charama Sloka”, promptly responded the teacher and taught its significant Mysteries. The more Alavandar meditated on these, the more they entered deep into his heart. The saving Grace taught therein made him more and more inclined to surrender himself to God, and more and more to cultivate the sense of resignation to His will. His soul bent more and more to Him with the nourishment the teachings gave, just as the ripening grain-stalks bend as they receive more milk. As days passed, his love for the Merciful grew warmer and warmer; and as this love increased, his attachment to other things; became weaker and weaker. After this, a determination came to him to renounce the world, and don the robes of the Sanyasin, in as much as the love of the world and of God were incompatible with each other. Hence forward he devoted himself to divine contemplation and service. 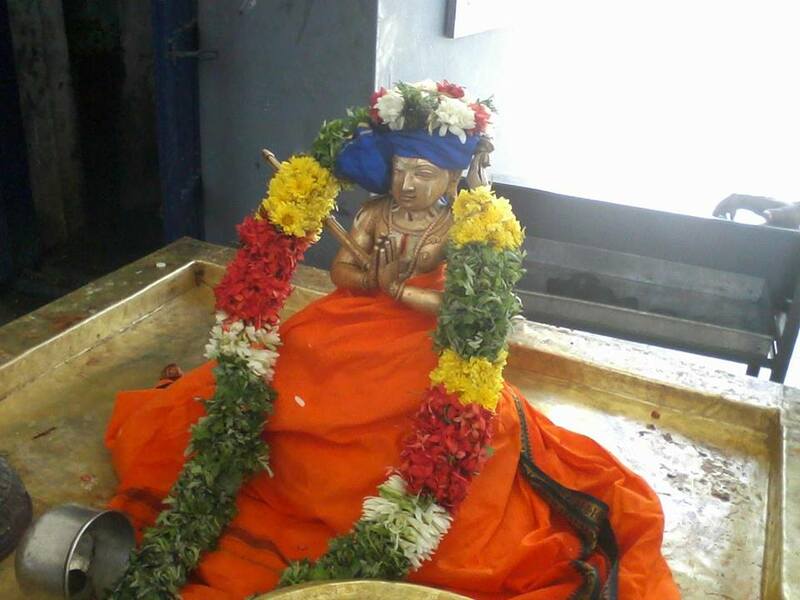 Swami Manakkal Nambee was binding force for srivaishnavam to progress.